The surprising direct result from all this is that garlic does attack bacteria, viruses, protozoa and fungus. Thus it is strongly indicated for any clearly infectious ailment assaulting the body. It is probably not sufficient although that needs to be thoroughly investigated. 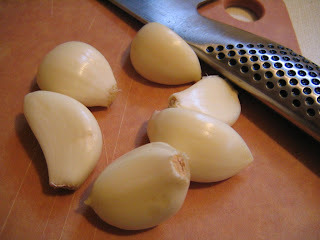 A large dose of garlic is a daunting option but it surely needs to be better understood. Can you imagine a bowl of strong chicken soup with several roasted garlic cloves cooked into it with a touch of miso perhaps? Perhaps the key to chicken soup was always the garlic. The good news is that the direct benefits of using garlic are no longer lacking scientific support at all. (NaturalNews) The U.S. National Library of Medicine released a review in March 2012 of all available clinical trials involving garlic's effectiveness for the common cold. The intent was to explore clinical evidence for the popular belief that garlic "is good for" colds in humans. Traditional, anecdotal, and even clinical research supports the fact that the allicin contained in garlic has both anti-bacterial and anti-viral properties. The medical journal Applied Microbiology and Biotechnology published a clinical study in 2001 stating that garlic has "a wide spectrum of actions." Garlic kills bacteria, viruses, protozoa, and fungus. The researchers commented that because of the popularity of natural and herbal treatments for a variety of illnesses and conditions, interest in medicinal plants is now at the forefront of investigation in the field of pharmacology. In addition to its anti-microbial properties, garlic has positive effects on the immune and cardiovascular systems. The Journal of Nutrition published a 2006 critical review which discussed the effectiveness of garlic in the treatment of cardiovascular disease. The medical journal stated that scientists have established that cardiovascular disease is helped by the consumption of garlic on a regular basis. Garlic lowers "bad" cholesterol levels, lowers blood pressure, and provides antioxidants. Of particular interest is the comment made by the authors in the study regarding mixed reviews in some clinical trials involving garlic. The researchers noted that many of the studies were conducted improperly, affecting outcomes. Conflicting evidence was due to several factors: a variety of garlic preparations were used, there may have been mistakes with subject (patient) selection, the study was not properly randomized, or the duration of the trial was too short. Regarding clinical evidence that garlic either prevents or treats the common cold, only one clinical study was performed "correctly," according to the authors gathering evidence for the venerable Cochrane Database for Systematic Reviews. In this study, 146 participants took garlic daily for three months. The study was randomized and placebo controlled. Other controls included no treatment for colds at all, or using other forms of treatment. Participants in the garlic group had fewer colds than those in any of the other groups. The length of the colds were roughly the same in all groups, between four and five days. The conclusion of the clinical trial was that daily consumption of garlic "may" help to prevent colds, but larger studies need to be done to confirm the possibility. Pubmed.gov, "Antimicrobial properties of Allium sativum (garlic)." Harris JC, et al. Applied Microbiology and Biotechnology. 2001 October; 57(3): 282- 6. Pubmed.gov, "Garlic and cardiovascular disease: a critical review." Rahman K. and Lowe GM. Journal of Nutrition. 2006 March; 136(3 Suppl): 736S- 740S. This article is provided courtesy of Donna Earnest Pravel, owner and senior copy editor of Heart of Texas Copywriting Solutions.com. Get free weekly tips on natural healing and herbs by visiting her blog, Bluebonnet Natural Healing Therapy.